Scanning the trusty Plant Spotlight archive on this site, I realize I haven’t done a very good job of nailing down what I consider to be the fifteen or so essential perennials for northern gardens. Correcting this oversight is my plan for this new season, so naturally I’m starting with Coral Bells. Sometimes I forget how many gardeners aren’t familiar with the plant. Interestingly, I was speaking on the topic of perennial plant combinations in Florida this winter, and I kept mentioning Huechera/Coral Bells to the audience, in a matter of fact, you-all-know-about-it way, and it turns out they can’t grow it that far south. They can’t grow Siberian Iris, or peonies, either. So chalk one up for us frigid fools from the tundra. It’s all about foliage, and in this regard, Heuchera is hard to beat. Leaves appear in great abundance, are heavily lobed, and, depending on the variety, may be roughly maple-leaf shaped or even more esoteric. Topside of leaf is a different color/hue than the bottom. It’s a low (usually 6″-12″), mounding plant, which sends up slender, leafless scapes of tiny flowers mid-season. Colors range from white to a variety of pinks. In bloom they look like tiny fireworks. Interest has grown immensely in the past few years, and valuable new introductions have been a part of that. Most common include ‘Amethyst Mist’ (amethyst w/ silver foliage), ‘Chocolate Ruffles’ (chocolate foliage, burgundy underside), ‘Jade Gloss’ (silver-red foliage), ‘Palace Purple’ (greenish purple foliage, light purple underside), ‘Pewter Veil’ (purple w/ silver foliage), ‘Plum Pudding’ (plum-purple w/ silver veining) ‘Regina’ (burgundy w/ silver veining). There are literally dozens more; full botanical genera and species range through Heuchera americana, H. x brizoides, H. micrantha and H. sanguinea. 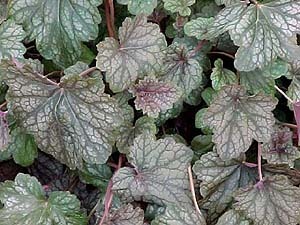 Coral Bells prefer light shade and good gardening soil amended with organic matter. Can grow in areas of full sun, but give them good soil and do not let them dry out. In all instances, the plant prefers soil that drains well, and they like to be kept evenly moist. Coral Bells develop woody crowns that tend to grow up out of the ground after just one season. Push it back down, or add soil to raise the level of soil up around the crown. Divide the plant in spring every two to three years, discarding woody portions of crown. Be sure to provide winter protection to plants the first winter after planting. But you need to remove the winter mulch early in the spring, as the plant is prone to suffocating if left covered too long.